I had grand plans of making something really great for OLS this week, but I got busy with other things so we had to make do with a simple meal. Pasta is my mainstay for a quick dinner, but unfortunately that part of the meal isn’t local (I was going to make some pasta – I even got the pasta machine out – but it didn’t happen). I threw some green beans and a handful of broad beans (both from the garden) in with the pasta for the last few minutes, and tossed them with the last of my frozen pesto and some fresh chopped tomatoes (yes, we’ve finally had a few ripen, but they came from a plant that my mom bought, so it doesn’t count – when the ones I started from seed start ripening, then I’ll be happy!). Everything was topped off with a liberal sprinkling of organic BC parmesan cheese. A loaf of locally made bread and a salad with homemade dressing finished everything off. Using non-local pasta feels like a bit of a cop-out, but I’m taking comfort in the fact that all of our meals today were pretty local (possibly even more so than this one). We had our favorite peachy pancakes for breakfast (is anyone else totally excited that it’s peach season?! ), and a local baguette with garden tomatoes and brie for lunch. That looks good. We do pasta as a quick meal. I must confess, I don’t do the local thing like you do, however we do try to eat as much from our own hands. We have the garden and berries and apples to work with, we have milk, eggs poultry, lamb and beef from the farm which is 50 km away, and the garden. I like to read your blog and get ideas for other local and green ways to do things. Thanks for sharing. 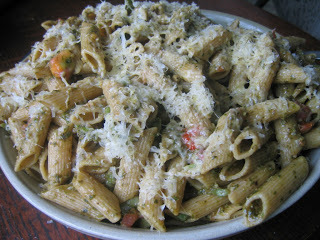 Delicious!I love pasta and noodles meals too!Your picture looks really good….Yummy! Hooray for peaches!! Peach pancakes sound delicious. I’m jealous of your local parmesan – that pasta looks fantastic! I think you do an awesome job of living sustainably. Pat yourselves on the back. My grown kids are also getting very involved. Our son is redoing the floors in his house and he’s using bamboo instead of oak or other hardwood. I also just listened to a radio program about the need to stop using cyprus mulch. Sorry for going on here – thanks for your inspiration. Dawn – That sounds pretty local to me!! Steffi – I love pasta too, I would happily eat it every day. Chelee – Thanks, I see that you had pesto for dinner too! Mary – I’m starting to realize how lucky we are to have such amazing cheese makers nearby. Lu – I’m so thrilled that you’re feeling inspired to try some new things! We’re thinking of doing bamboo floors in our house, too. I’d love to hear how your son likes his floors when they’re done.